Although French and Portuguese missionaries started the Romanized writing system, Vietnamese journalists, poets, scholars, and writers improved, advanced, and made Quốc ngữ into a robust, eloquent, comprehensive writing system. In the example above, the Chinese characters 天 (top left), which means heaven, and 上 (bottom left), which means above, are combined to make the Nôm character ᗶ (right), which means sky. The Romanization of the Vietnamese writing system began in the seventeenth century when Catholic missionaries needed to transcribe scriptures for their new converts. As chữ Nôm was used only by the elite and the privileged, the missionaries wanted to introduce religious text to a broader population, including lower-class people who would not have been able to read Nôm ideographs. In 1624, French Jesuit and Lexicographer Alexandre de Rhodes began his mission in Cochinchina where he met Portuguese Jesuit Francisco de Pina and learned Vietnamese at an astonishing speed. Within six months, Rhodes mastered the language. Unfortunately, Pina died in a shipwreck in Đà Nẵng a year later. Rhodes went on with his mission and spent twelve years listening to the local people. 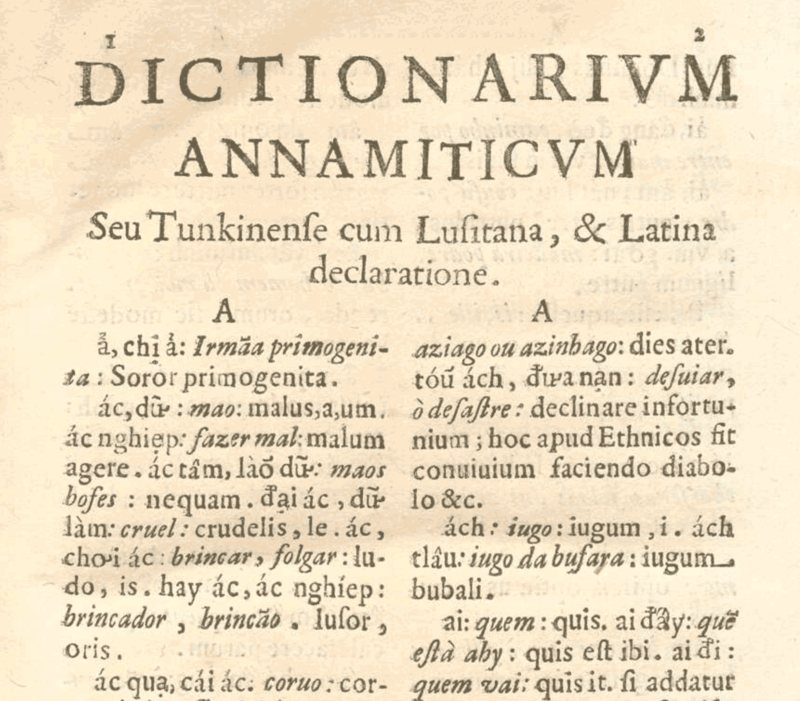 In 1773, more than 100 years later, French Jesuit Pierre-Joseph-Georges Pigneau de Béhaine published Dictionarium Anamitico-Latinum in Latin, Nôm script, and Quốc ngữ. In 1838, Bishop Jean-Louis Taberd followed up with Dictionarium Anamitico-Latinum , which was based on Pigneau de Béhaine’s work. One of the early adopters of the new Vietnamese writing system was Philipphê Bỉnh, a Vietnamese pastor who lived in Portugal. During his thirty years in Portugal, Bỉnh had written more than twenty one books in Quốc ngữ. His writing showed that Quốc ngữ had started to take shape. Unlike chữ Nôm, which required extensive studying and practicing to master, the new Latin-based writing system was direct, approachable, and accessible. Vietnamese people could learn to read and write their own language in a few weeks instead of years. Even though Quốc ngữ made it possible to spread literacy and education to a large population, it did not become the official writing system until the early twentieth century under the French colonial rule (1864–1945). The rise of the Latin-based writing system opened the door to education and print publications. 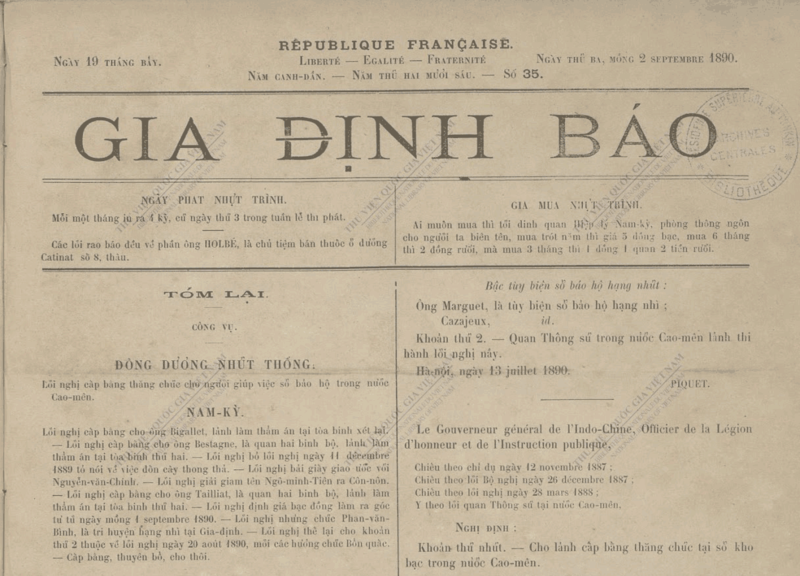 Gia Định Báo (嘉定報), the first newspaper in Vietnam, published its first issue in Quốc ngữ on April 15, 1865. Under Director Trương Vĩnh Ký and Editor-In-Chief Huỳnh Tịnh Của, Gia Định Báo played an essential role in encouraging the Vietnamese people to study Quốc ngữ . Trương Vĩnh Ký had written over 118 publications ranging from research to transcribe to translate. In 1895, Gia Định Báo released Huỳnh Tịnh Của’s Đại Nam quốc âm tự vị , the first dictionary written by a Vietnamese scholar for the Vietnamese people. In 1907, Vietnamese scholars such as Lương Văn Can, Nguyễn Quyền, and Dương Bá Trạc opened Đông Kinh nghĩa thục , a tuition-free institution in Hà Nội to help progress the country. In recognizing the advantage of Quốc ngữ, which was easy to read and write, the school used the Romanized writing system to publish textbooks, literary works, and newspapers ( Đăng cổ Tùng báo and Đại Việt Tân báo ). 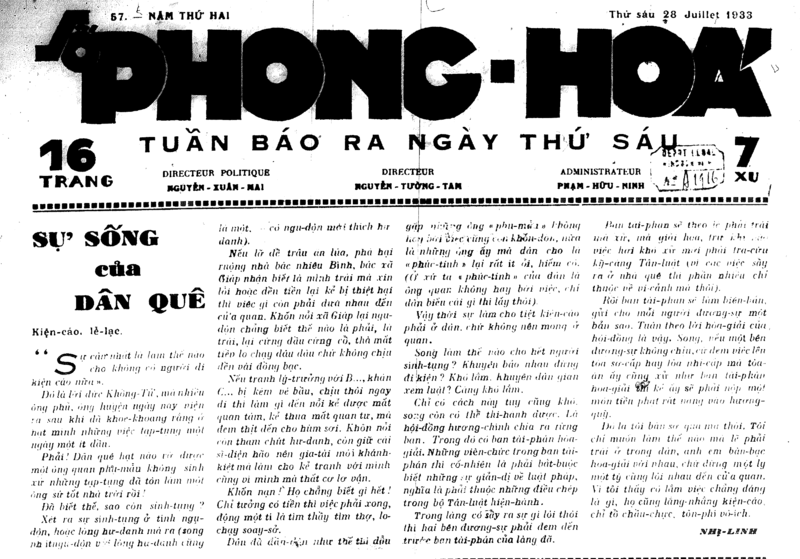 Around the same time in 1907, Journalist Nguyễn Văn Vĩnh opened the first printing company and published the first independent newspaper called Đăng cổ tùng báo in Hà Nội. In 1913, he published Đông dương Tạp chí to propagate Quốc ngữ. Both Nguyễn Văn Vĩnh and Trương Vĩnh Ký were known as the godfathers of the Vietnamese newspapers. From 1917 to 1934, Writer Phạm Quỳnh contributed many important essays on literature and philosophy in his own publication called Nam Phong tạp chí . He also translated many French literary works into Quốc ngữ. Although French and Portuguese missionaries started the Romanized writing system, Vietnamese journalists, poets, scholars, and writers improved, advanced, and made Quốc ngữ into a robust, eloquent, comprehensive writing system. Today, Quốc ngữ, also known as chữ phổ thông (standard script), is the official orthography of Vietnam. 1 Thompson, Laurence. A Vietnamese Grammar . (Washington: University of Washington Press, 1965), 52. 4 Fernandes, Gonçalo, and Carlos Assunção. “First Codification of Vietnamese by 17th-Century Missionaries: the Description of Tones and the Influence of Portuguese on Vietnamese Orthography,” HEL 39 (Universidade de Trás-os-Montes e Alto Douro, 2017). 5 Lương, N. Hiền “Chữ Quốc Ngữ Chữ Nuớc Ta: Từ Alexandre de Rhodes đến Trương Vĩnh Ký.” Tập San 11 (Australia: Nhóm Nghiên Cứu Văn Hóa Đồng Nai & Cửu Long, 2017).